Vintage rugs from Morocco – Morocco is a land of exotic colors, aromas, people and of course – carpets! The country’s unique aesthetic has had a profound effect on today’s eclectic style. Wood, glass, tiles, leather and a wealth of sensuous materials give their furnishings and architecture tremendous appeal. These exotic textures, vivid colors and fantastic surface patterns are readily welcomed in modern and traditional interiors. The older vintage rugs that were woven in the North African country of Morocco include the most famous Beni Ourain rugs as well as the Moroccan Berber carpets. 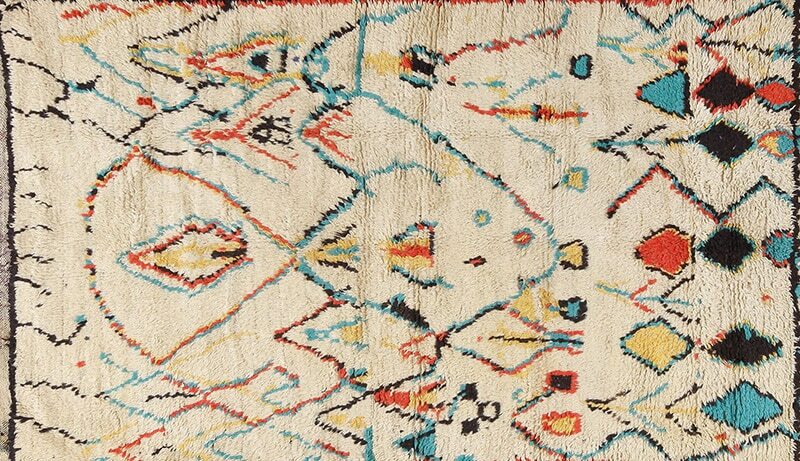 These vintage shag carpets are some of the more unique forms of North African textile art. 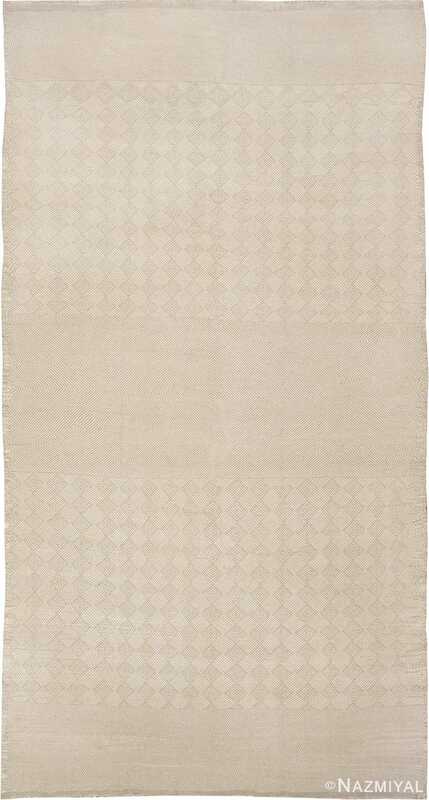 Each of the rugs from Morocco is unique in its look and even in its specific approach to form and pattern. That is mostly because they were woven by skilled rug weavers in Morocco who never really studies art history. Therefore their approach in one that more closely aligned with the more primitive folk art and outsider art movements than with any other artistic approaches. Largest Collection of Rugs from Morocco – As the renewed interest in mid-century modern design is in full swing, vintage rugs that were woven in the north African country Of Morocco, with their distinctly minimalist aesthetic, have become one of the most popular rug styles available today. These alluring compositions feature a distinct style, generally characterized by ivory fields and simple black or brown lines that makes them uniquely suited to mid-century modern focused interiors. Genuine vintage pieces from Morocco are considered to be especially desirable, due to the high quality of their materials as well as their cultural authenticity. 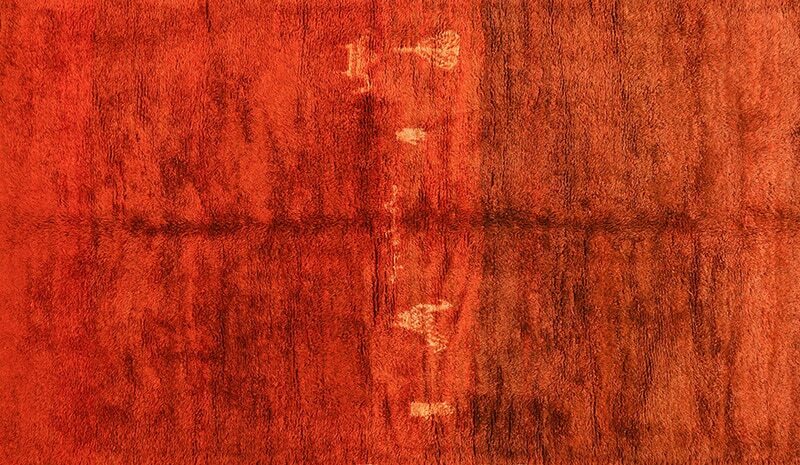 The Nazmiyal Collection in New York City, one of the largest purveyors of antique rugs and vintage carpets in the world, boasts one of the most exciting collection of these coveted rugs. This includes the especially remarkable selection of over one hundred pieces, which Nazmiyal has just recently acquired. With hundreds of examples, each one unique, handmade and exceptional, the Nazmiyal Collection offers a unique opportunity for interested parties to experience the artistic appeal of mid-century Moroccan rugs on a grand scale. 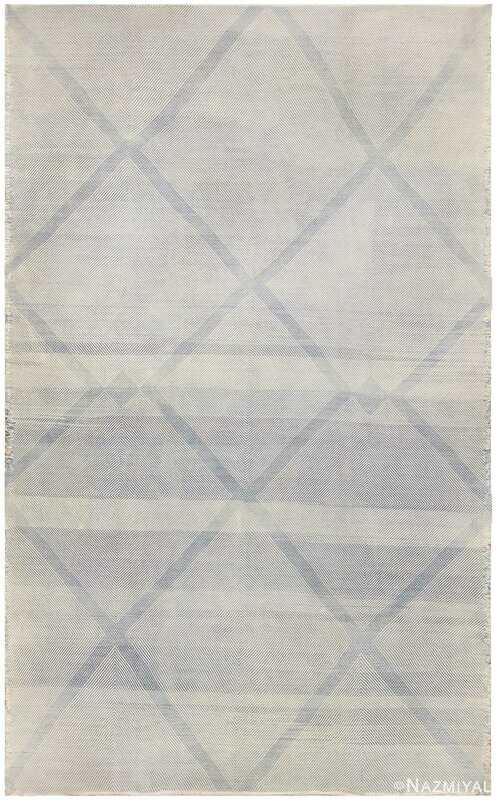 These carpets from Morocco offer a dizzying array of beautiful and impressive designs. 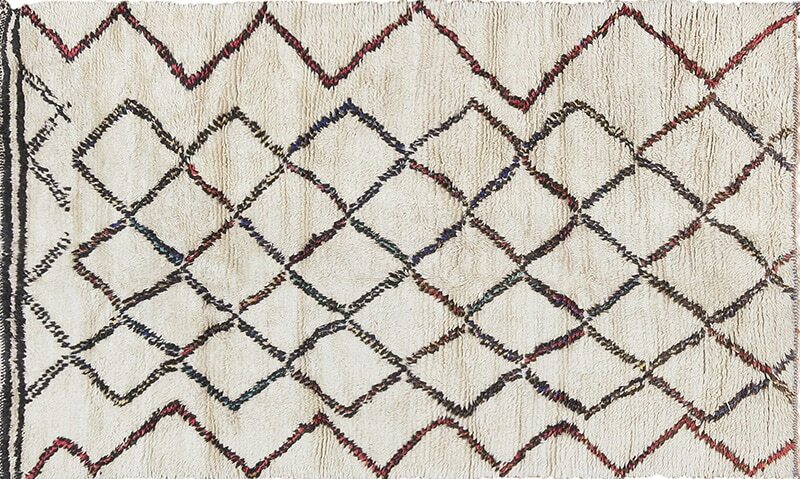 While many vintage mid century modern rugs from Morocco feature an ivory field and a simple pattern composed of black or brown lines, Nazmiyal’s collection includes dozens of delightfully tribal and vibrant examples as well. Some of these carpets feature oblong geometric figures and abstract splashes of color, sometimes splayed across the entire surface. Others feature the traditional ivory and black or brown combination, broken up by subtle touches of color. 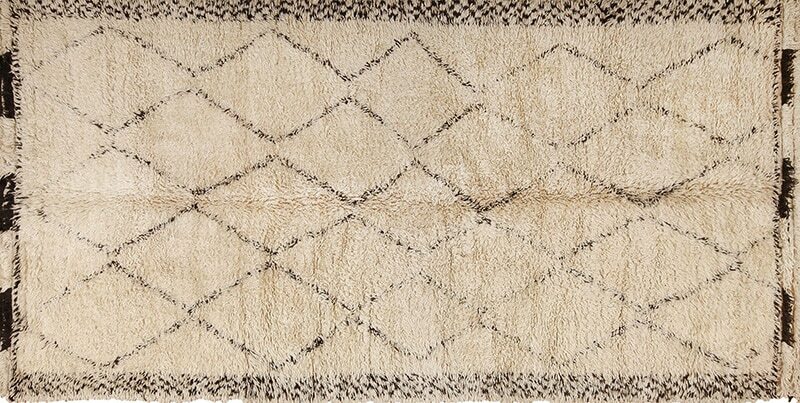 Mid-century vintage rugs from Morocco are also celebrated for their eco-friendly nature. Woven with fine materials and dyed with all natural vegetable carpet dyes, these carpets are a great example of what can be accomplished with all natural materials. 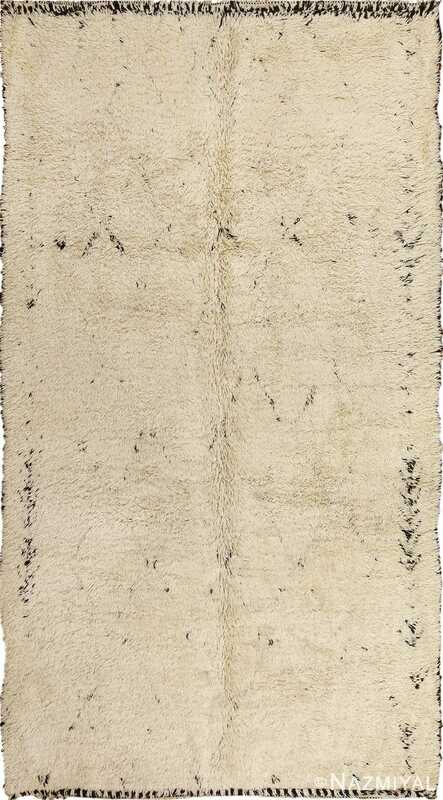 Further, the genuine vintage carpets from Morocco have a certain characteristic that makes them especially desirable: each piece is entirely unique, with no two pieces expressing the same pattern. 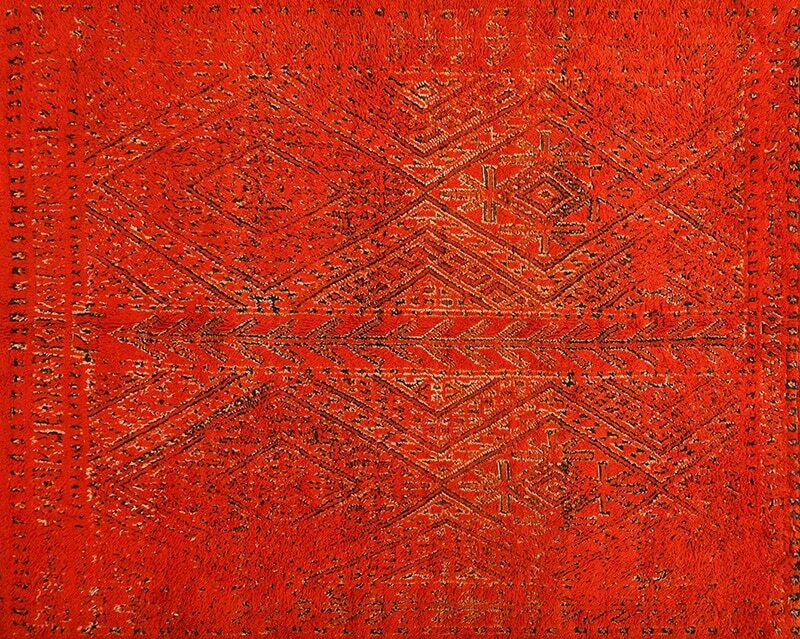 Dozens of examples in the Nazmiyal Collection’s selection of Morocco made carpets brilliantly showcase this characteristic – for even when there is a general similarity between two different rugs, there is always at least one small detail or another that clearly shows that the pieces are each unique, handmade works of art. Jason Nazmiyal, the owner of the Nazmiyal Collection, recalls his travels and experiences purchasing these exceptional rugs. “We’ve traveled extensively throughout Morocco to bring together the pieces in this collection,” recalls Mr. Nazmiyal. “We’ve traveled through the Atlas mountains, searching for the best examples we could find – often buying one rug at a time. Stylish, beautiful, unique and relatively inexpensive, vintage Morocco rugs are an exceptional art form. The Nazmiyal Collection, with hundreds of unique Morocco carpets, including dozens of particularly rare examples, is one of the best places to truly experience their erstwhile allure and popularity. 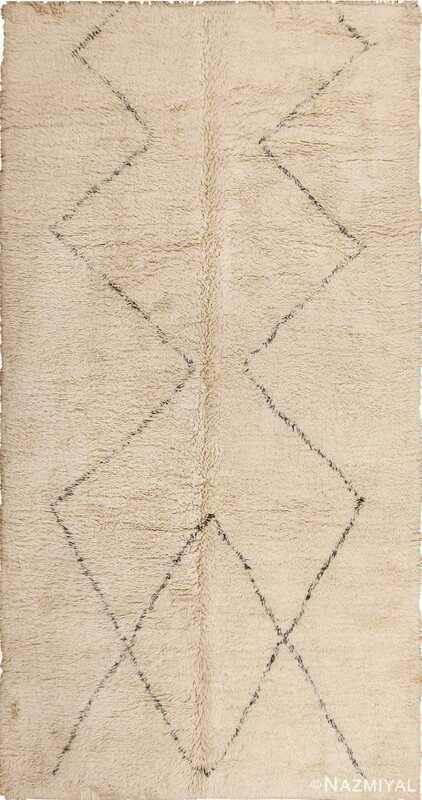 When used in creative ways, the vintage Moroccan rugs offer an artistic impact that is quite unique and impressive!